Wordpress can seem like a daunting idea if you are unfamiliar with the platform, and quite appropriately, as Wordpress can be used to achieve some very impressive, but equally complicated blog management options. However, Wordpress is also able to provide a simple and reliable blogging option without needing to use any complex features. 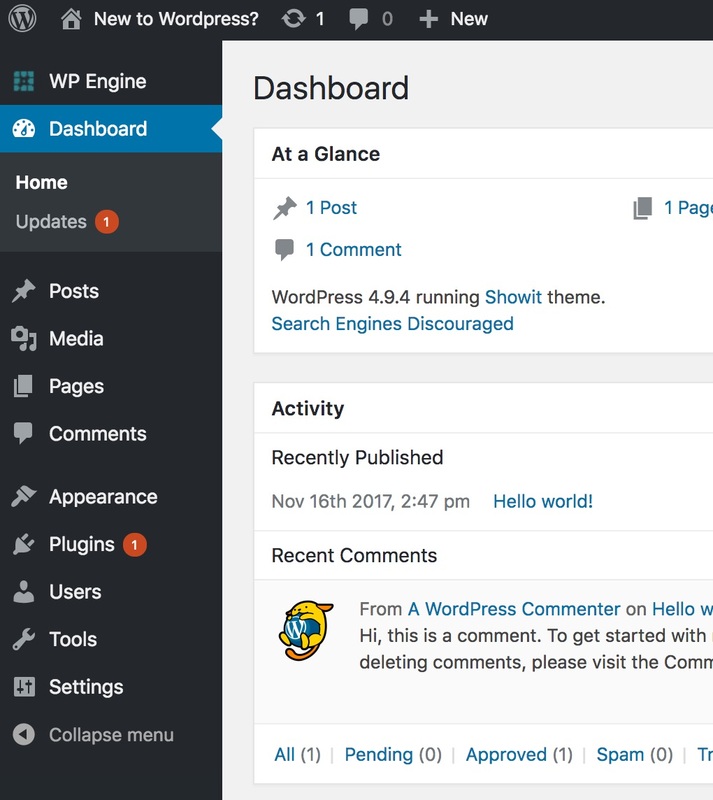 This article will hopefully provide a basic understanding of how to use Wordpress and navigate your dashboard for blogging purposes and provide some additional insight for the many more features it can offer. The first step to understanding how to manage Wordpress is to understand the layout and navigation of your Wordpress Dashboard. Your Wordpress dashboard URL and login credentials are provided by our support team after the completion of your blog setup. 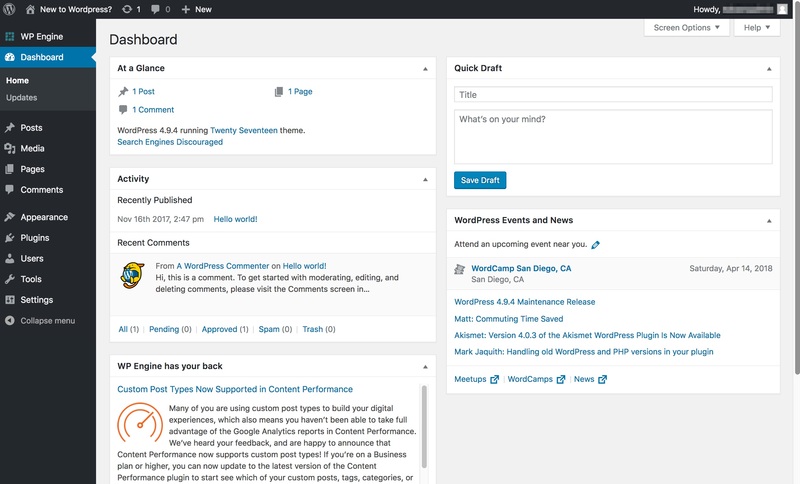 The dashboard home will give you a snapshot of your blog details and settings. The "At a Glance" section highlights how many current blog posts, blog web pages, and comments on your blog. On the left side of your screen you will see a navigation bar with a handful of settings. The top 4 options (below the Dashboard link) are related to what content is available on your blog that users can view whereas the following 5 settings will allow you to set how you blog functions. Posts - This is the location where new blog posts will be created or to manage any existing blog posts. As blogging is the core function of Wordpress, this will be a frequent location you visit in order to do so. Media - Your media library holds all files you have uploaded to wordpress including images, graphics, video, pdfs, or others. Pages - Pages allow you to create wordpress specific pages which differ from Showit website pages. Wordpress pages are commonly only used for ecommerce options or other advanced features and may not be needed for general blogging purposes. Comments - The comment section will hold all Approved, Pending, or marked Spam comments. You can view specific details to any comments here. Comments can be left on blog post by visitors. By default they are assigned as "Pending" until you approve the comment. The associated admin email for the blog will receive a message upon a comment submission. Appearance - This section allows you to set or change the active Wordpress theme (or rather design). The appearance settings are activated by default by the Showit team and generally do not need to be adjusted **note that the Showit theme is not edited inside Wordpress so this option not widely used. Plugins - Here you can enable plugins or add custom plugins(*advanced blogs only) to your wordpress blog. A list of included "Approved" plugins for the basic With Blog plan can be found here. Plugins provide additional tools and features that can help transform your blog into a powerhouse for your business! As a good note to follow, keeping plugins updated is recommended for both security purposes as well as preserving functionality with plugins. Tools - Default tools include options to export or import blog content from a different source. Certain plugins can add additional tools and tool settings. General - General blog information and settings. Includes website title, description, admin email, user settings, etc. Media - Settings used for managing your media library and media thumbnails. Showit - Used for connecting, managing, and activating the Showit theme with Wordpress. 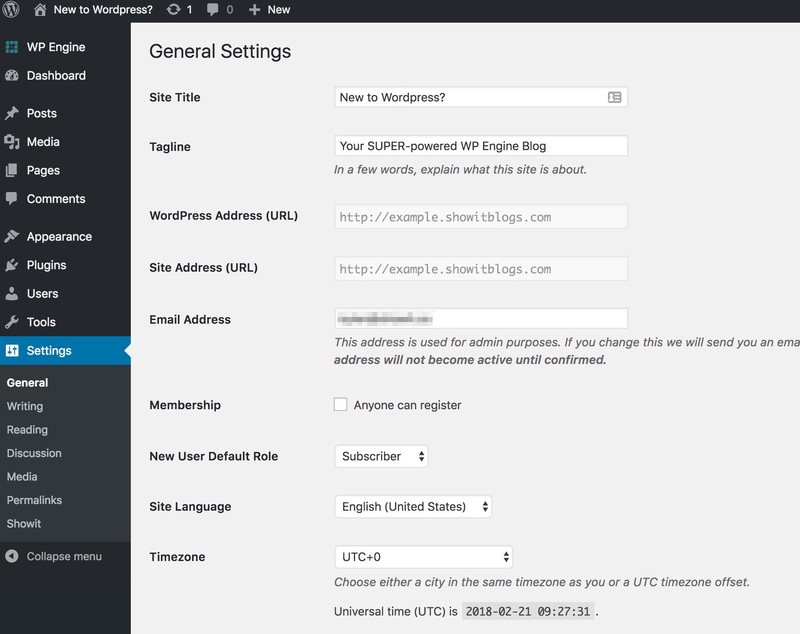 **As a good rule of thumb, it's best to leave any settings you are unfamiliar with or do not understand unchanged in order to allow Showit to interact correctly with Wordpress. Changing settings without an understanding of their function can break certain aspects of your blog. If this happens by accident, usually reverting the changes you made will fix the issue. Contact support about any persistent issues or questions. The following article will provide additional information on how Showit and Wordpress work together.